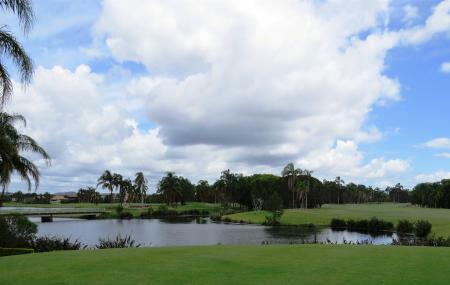 Lush green meadows and clear waters of the lake define the beauty and grandeur of Palm meadows golf course. Set in an unfrequented part of Carrara, the place is a must hang-out for the golf lovers as well as nature lovers. You can take a nice long stroll in the open gardens and can explore the place. Enjoy playing with friends and family or go for a feast with them, Palm meadows is the best option for an exciting one day outing. You can hire a golf kit from the place as well as you can carry on your own. Enjoy dining at the nearby restaurant owned and run by the golf course itself. Have a small friendly match with your colleagues, friends or family. Gooding Drive at Palm Meadows Drive is the nearest bus stop to the place. You can also hire a taxi upto the golf course. How popular is Palm Meadows Golf Course? People normally club together Lakelands Golf Club and Metricon Stadium while planning their visit to Palm Meadows Golf Course. Good Course friendly staff well worth a visit.